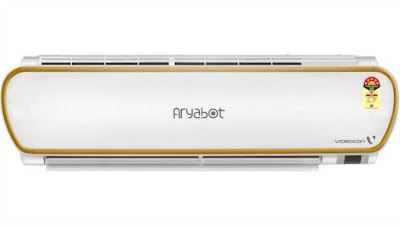 Videocon has unveiled the World’s first Satellite AC, Aryabot made using futuristic technology trends in world. With the launch, Videocon aims to capture the growing Machine-to-Machine (M2M) communications and Internet of Things (IoT) related devices. Aryabot is an intelligent device with futuristic features that are based on the IOT phenomenon. It can be easily paired up with smartphones and smartwatches, allowing GPS access through connectivity to multiple satellites. The unique feature responds to the user’s GPS position to switch off the AC when one leaves the house and switches it on before one enters the set radial distance using the Geo-Fence feature. In order to tackle security and intrusion issues, Aryabot comes with a dedicated USB slot for a webcam connection. The webcam streams live video on the smartphone through the integrated application. Aryabot is easy on one’s finances and keeps tab of power consumption. Through its budgeting feature, one can set electricity consumption limits which helps to plan the spending in advance, and also view daily, weekly and monthly energy consumptions and expenditures. With the added option of controlling the AC without touching any control buttons, Aryabot lets one dictate instructions with the embedded voice command feature. The Sleep Graph mode allows to set desired temperature levels for each hour of the night. One can set different temperatures for next 8 hours to ensure a sound sleep. And if the weatherman fails to forecast the temperature, Aryabot will sense the outside temperature and automatically adjust to set temperature inside. The AC also intelligently detects problem areas and suggests remedial actions basis its algorithms. It also has the ability to contact the service centre on its own and log in service requests. All these features and many more can be controlled using any Android and iOS based smartphones and smartwatches through an app. Videocon has rolled out 8 new models in the Aryabot series that comes in a stylish curve indoor unit. All ACs in the range comply with BEE star ratings and possess 5 and 3 stars, reflecting its high energy efficiency capabilities. These are available across 1 ton and 1.5 ton. Prince range of Aryabot is Rs. 34,000 (1 ton) and Rs. 39,000 (1.5 ton).